OK here is the situation, I have a crab that is out of sorts, pegleg, he has been cranky lately. Today Calico jack, sweet crab with loads of personality, was coming up from a molt and pegleg attacked him in the hole. I took pegleg out of the hole and saw calico's shell and thought he was in it. a few hours later calico had not moved so I picked up the shell to find it empty. that is when I saw pegleg naked and retreating into his hole. I quickly rinsed the shell, cut open a 2 liter bottle and pushed it down over his hole with the shell inside. 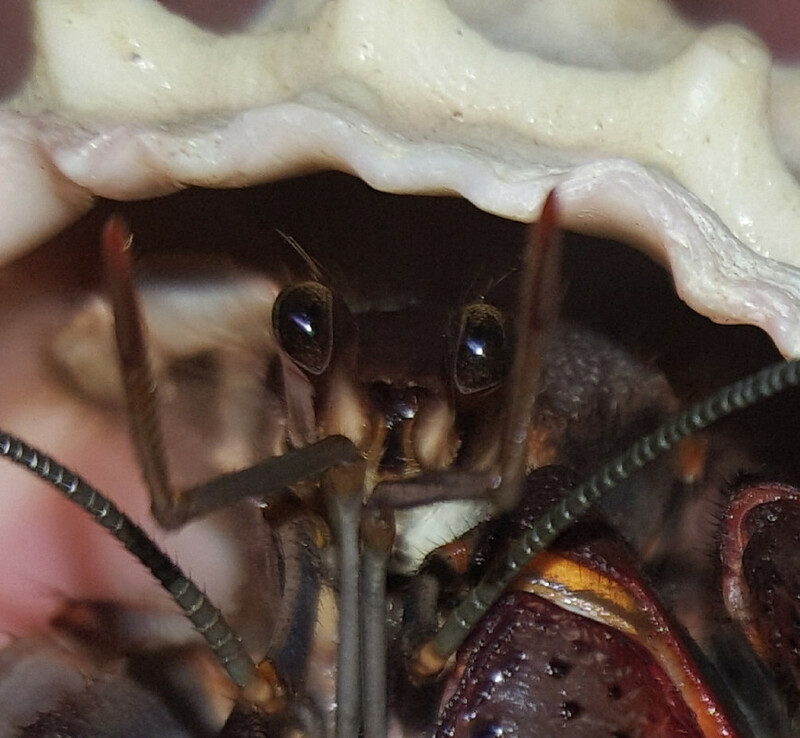 so he is protected, I am hoping that he will come out, get back in his shell and and once that happens I can give him a dunk in the salt water then he wont smell like food. Is there anything else i can do for him? please help my son is so upset.... and so am I.
I am sorry I was not clear, and now the situation now seems different. I am sorry. Ok let's start at the beginning. Pegleg has been up for a while. He is fine but surly, not himself, he pinched me the other night and broke the skin - he has never pinched me before, so I have been keeping an eye on him. Today I saw pegleg down in a hole. because I know he has been irritable and 3 crabs are buried, I took him out of the hole and saw under him a green shell that was the last I had seen calico in. I thought pegleg had attacked calico, so I picked up the green shell to find it empty. I was worried and looked in the hole to see a crab's front legs and claws retreat into the sand. I assumed the crab had been attacked by pegleg and left it's shell and retreated to save itself. I then rinsed the green shell and pushed the 2 liter down to protect what I thought was a naked crab. Then I posted and Sallrw responded ... Thank you! Sallrw, I did what you suggested and I started digging very gently, and I found a fine crab in a brown shell, he seems fine, just maybe scared. Now I am not sure if pegleg went digging, or if Calico was indeed trying to come up. ~It is even possible that Calico is naked somewhere and this is a different crab in a brown shell (maybe rainbow) as I mentioned, 3 crabs are buried right now, but it seems unlikely that 2 would be buried so close to each other. I am nervous to intervene too much more. I reburied the crab under a small amount of substrate and let them be, But I will checking on them frequently tonight. I don’t know too much myself about this type of situation except your not supposed to rebury them. Are all crabs now in a shell? Don't re-bury a crab - when they molt, they make a cave, and if you bury them, they won't have a cave. Yes, don't rebury! If the crabs are hard and moving then they should be fine to bring to the surface only if something goes wrong. I didn't know you had more than the two when I told you that you should gently go after the naked crabs. You were very lucky that you didn't dig up a fresh molter which are just jelly until they harden. A fresh molter will fall apart and not survive if you disturb them. But since you see it is hardened and can move, I would go ahead and bring it up if I were you. Don't rebury it. You can offer lots of eggshell, calcium food and protein. Let him get in the water on his own. Crabs know which one they need, fresh or salt. If you put him in salt water to rinse him and he isn't completely 100% hardened, the salt could very well hurt them. Just make sure both are offered for the choosing. As for the naked Calico, since you aren't sure where your other molters are, I'd leave him alone and not disturb anymore if it were me. Just see what happens. Thing could still be ok. As for Pegleg and Calico, do fill out that info in the link that curlysister says to fill out, something could be wrong in your crabitat. I don't want to interfere in their help for you and your crabs. Hope this helped some and I gave you the right information.